If you would like to receive a copy of our brochure please complete the form below and we’ll send you one right away and add you to our mailing list. We normally send out one brochure per year, in the autumn, but please keep checking our website and sign up for our email newsletters so you can stay up to date with all our tour information and availability. You can also view our travel brochure online as an interactive brochure or download a pdf to browse through at your leisure. If you have any problems while using the form please get in touch. 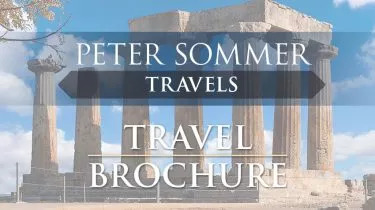 If you want a perfect holiday experience in Greece, choose the Peter Sommer Travels' Cruising to the Cyclades tour. The food and accommodations on the gulet are wonderful. The itinerary and sites visited on the Islands are well thought out for interest and variety. And, the guides offer an amazing glimpse of ancient Greece. They are able to narrow down what is of major importance/interest at each site. Add relaxing on the gulet and it adds up to an amazing vacation. We give Peter Sommer Travels an unqualified "excellent" rating in all aspects of their Exploring Wessex Tour, from initial contact, to booking, and finally, to the superb planning and site selection by the tour organizers. We also commend the deep knowledge, patience and humor of the guides. Being given special access to the inner circle at Stonehenge was a once-in-a-lifetime experience. We look forward to another tour with the company.